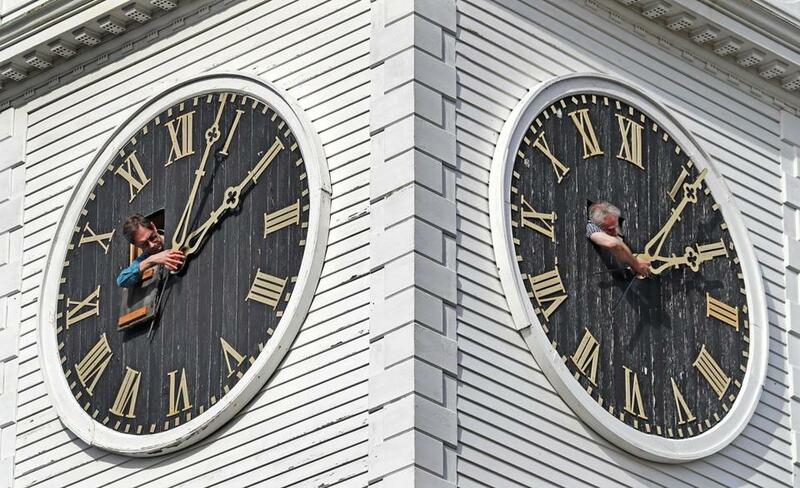 A state commission has signed off on a report that says year-round daylight saving time makes sense for Massachusetts. But don’t stay up late wondering about when it might become a reality. In a report approved in a 9-1 vote on Wednesday, the commission made what it says is a data-driven case for not changing the time twice a year, in March and November. But it also notes that remaining on Atlantic Standard Time all year — instead of switching back and forth between Eastern Standard Time — only makes sense if statewide standards are established for delaying school starts and if a majority of Northeast states agree to align their clocks with Massachusetts. Oh, and then the plan would need approval from the state Legislature and the US Department of Transportation. State Senator Eileen Donoghue, a Lowell Democrat who led the commission, said she hasn’t heard if any of her colleagues will submit a bill based on the report. She noted that the time zone shift has been discussed in legislatures in some nearby states. She expects future discussions could take place on a regional level, possibly among governors. “This is the beginning of a discussion, not the end,” Donoghue said. The commission found that staying on daylight saving time year-round — essentially adding an hour of afternoon sunlight in the colder months, and subtracting one from the mornings at the same time — could have several positive effects. The shift would help retailers and restaurants, for example, and could curb electricity consumption. It also would keep people from losing sleep as they adjust to the spring transition. Studies have shown an increase in traffic accidents and on-the-job injuries in the days immediately after the “spring ahead” weekend. The wording of the final report was changed from a draft version to include New York in the regional approach espoused by the commission; the earlier report just said a majority of New England states would need to go along. State representative Paul Frost, a commission member, had raised concerns that putting Massachusetts out of synch with New York would disrupt travelers and cause issues for local broadcasting companies, among other problems. But the amended language wasn’t strong enough for Frost — he was the sole commission member to vote against approving the report. “If you do not have New York, this is a no-go,” said Frost, a Republican from Auburn. State Representative Daniel Cahill, another commission member, said he was initially skeptical of the idea. But he said there’s been an outpouring of support from his constituents in favor of switching. “I would say it seems that it’s a 20th century policy that has outlived its usefulness,” the Lynn Democrat said. Those fascinated with the subject will have 60 extra minutes to contemplate it over the weekend — daylight saving time ends at 2 a.m. Sunday, when clocks get pushed back an hour.